"I enjoy working with people to 'discover' and enjoy colors and textures that will inspire them. I consider it an important part of my job to create the right combination of these two elements, and I enjoy the process of doing so. Once fine tuned, the combination of color and texture will add years of enjoyment to a person's walls. I believe a terrific finish that is well executed will outlast changing design trends." 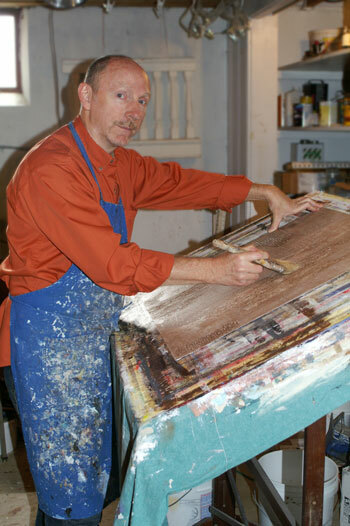 Mark Tillman has been involved in the decorative painting arts for over 20 years. Originally from Caruthersville, Missouri, he received his BA from Webster University in St. Louis. Mark trained with many decorative painting professionals in various seminars throughout the U.S. He is an active member of IDAL (International Decorative Artisans League) and a past president and board member of Metro Artisans Guild. American Academy of Decorative Finishes: Scottsdale, Az. Chicago Institute of Decorative Finishing: Chicago, Ill.
Faux Design Studio: Chicago, Ill.
Institute of Faux Finishing: Denver, Colo. Artistic Living Studio: Sacramento, Calif.
Lori Lemare Studio, Inc. Toronto, Canada.